The Team Jack Foundation, in partnership with the Nebraska State Legislature, has committed to a $3 million project for the development of a pediatric brain tumor program at the Fred & Pamela Buffett Cancer Center. Andrew Hoffman, board chair of the Team Jack Foundation, gave this statement: "On behalf of the Team Jack Foundation and all the children and families affected by this disease, I am proud to announce that we are ready to stand side-by-side with our state's great legislative body, and provide matching funds for this project. We are not only humbled by this opportunity, but are honored that the great State of Nebraska has agreed to take a stand with us against this disease." Andrew Hoffman, board chair of the Team Jack Foundation, testified for LB 110, a legislative bill to appropriate funds for pediatric cancer specialists, at the Nebraska State Legislature's Appropriations Committee Hearing this past legislative session. Included in the appropriation are funds to support two additional pediatric cancer specialists. In May 2015, the legislature approved the bill, which helps fund a $3 million project to develop a pediatric brain tumor program at the Fred & Pamela Buffett Cancer Center. The legislature approved $1.8 million in general funds for 2015-16 and $1.8 million for 2016-17 for pediatric cancer, of which $1.5 million per year is for pediatric cancer research and $300,000 per year is for pediatric cancer specialists. 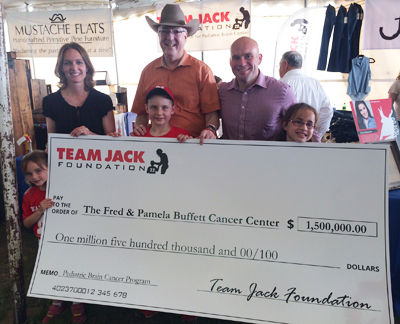 Team Jack committed to privately raising $1.5 million more toward the pediatric cancer specialists over six years. Team Jack presents a check to Ken Cowan, M.D., Ph.D., at the Cattlemen's Ball this year. "The State of Nebraska and Team Jack Foundation have reached an important milestone in treating and researching pediatric brain cancer and giving our children access to the best treatment possible," said Ken Cowan, M.D., Ph.D., director of the Fred & Pamela Buffett Cancer Center. "It is a terrible disease affecting our children and we are honored to stand with them. This funding will be a game changer for the children of Nebraska and surrounding area." UNMC/Nebraska Medicine physician and longtime Team Jack supporter Don Coulter, M.D., said organizations like Team Jack are important -- and the med center's collaboration with this nationally recognized Nebraska organization is fitting. 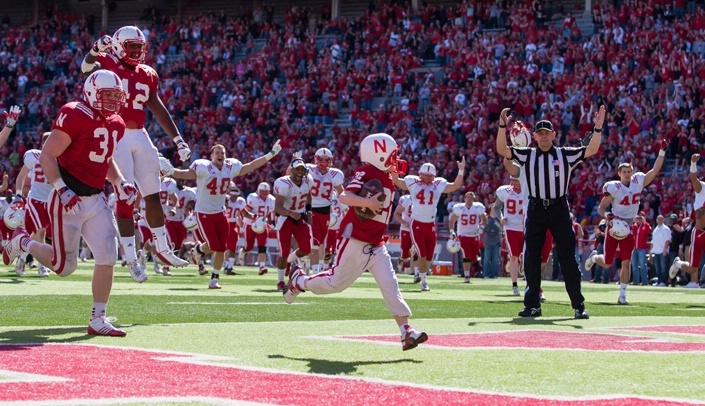 "Even though Team Jack is known around the world because of Jack running the touchdown during the spring football game, it's still a Nebraska organization, started by Nebraska people and run by a Nebraska family," Dr. Coulter said. "It's incredibly important for the academic leader of the state, as the medical center is, to be involved with a Nebraska project like that." Pediatric cancer research currently represents only about 4 percent of the research dollars that are given to cancer in the United States, Dr. Coulter said. As a result, grassroots organizations like Team Jack are exceedingly important. "There are not enough research dollars to go around, and it's really hard to get those research dollars," he said. "So when families who are affected by the disease start to develop foundations that can add to the knowledge that we have of the disease, come up with treatments for the future, make it easier for the next people who have to deal with the disease -- I think those are ways that we can really move the research forward for pediatric cancer." Team Jack has a number of upcoming events to help raise money to fight pediatric cancer, including a radiothon and a 5K run in Atkinson, Neb. For information on upcoming Team Jack events, click here.